The drop-down term selector tells you what term you're looking at. It also lets you jump to any other term—just select another term to update the screen. The term selector defaults to the current academic term. You can change the default term display in Academic Settings. Academic Term features several reports that give you a look at the essential info—enrollment figures, students, courses, faculty, and so on. Most of the reports include a filter that lets you sift the report down to find particular people who fit certain criteria. Info shows you the big picture of the Academic Term: start and end dates, statistics, and so on. Additional settings and requirements (full-time and Pass/Fail thresholds, grade scale) that affect the term can be found in Academic Settings. The basic info was entered when the term was created. If you need to change anything, click edit in the header. Statistics are aggregate totals from all courses and programs. Because of how the Students Table counts students, some of the figures here will differ from those you find on the Students Table. There are several ways to register students for courses. Online enrollment lets students self-register to enroll, audit, or get on the waiting list for courses. This article describes the various settings that affect how online enrollment functions. Click edit next to Online Enrollment. Select a class standing or tag and click Add. For each standing or tag, enter the date you wish them to be able to start registering. You can also enter a date on which Everyone can start registering. This enables auditing, part-time, and non-matriculating students (who typically do not have a Program) to start registering. Enrollment periods conclude on the term's add/drop date. If a course in that term has a unique add/drop date, enrollment for that course will end on that date. Advanced options for online enrollment let you introduce a delay and/or "lottery" for student registrations. 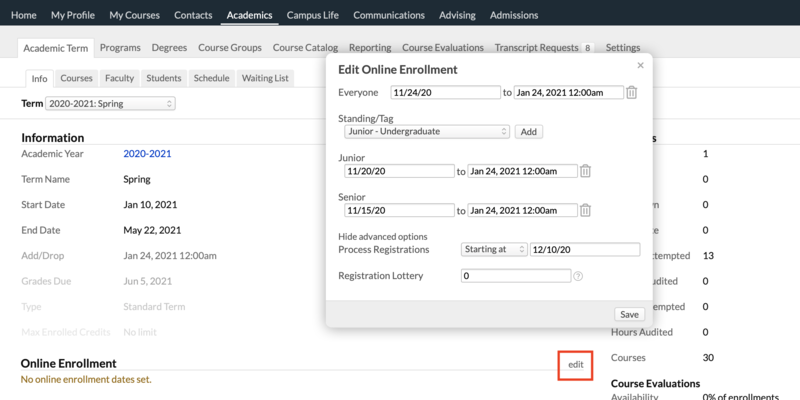 In the Edit online enrollment dialog, click show advanced options. To delay registration processing, select starting at next to Process Registrations. Enter the date/time at which you wish to process registrations. To introduce a registration lottery, in which registration order is randomized, enter the number of minutes over which you wish to spread the processing order (the example below will explain this...). After saving, you should consider editing the Registration processing message setting in Academics > Settings. 300 students register between May 20 - 29. When they submit their registrations, they see something like this. During the wait, students will not be able to submit any further registration changes. At 12:00PM, May 30th, Populi begins processing the 300 registration submissions. Over the course of the 10-minute lottery, it randomly selects one of the registrations and sorts out whether the student's registrations for individual classes are granted. It considers things like enrollment/auditor limits, waiting lists, and so on. The student's registration view updates. Populi emails the student with the results of the registration. At this time, the student can go back to the Registration view and see about making changes. The delay and lottery also apply to others using the Registration view—for example, Advisors, Registrars, and Academic Admins who enroll students with a registration lock. These users can circumvent the delay/lottery by enrolling students on the Profile > Student view or on Course > Roster. Course evaluations let your students anonymously submit their opinions on your courses and faculty. Click edit next to Course Evaluation Availability. Enter the start and end dates/times for when they'll be available to students. Enter a date/time if you wish to lock grades for students who haven't completed the evaluation. Their grades will remain locked until they complete the evaluation. You can also enter a date at which the lock will be lifted even if the student never completes an evaluation. After setting up evaluation availability, you can adjust it for individual courses on the Course > Info view. It works the same as the one described above, except that it also lets you change that course's evaluation. The Courses view shows all of the term's course instances. This article describes how to add courses. The Info toggle shows you basic course info—faculty, enrollment stats, and suchlike. The Progress toggle gives you a high-level view of course activity—how many assignments have been graded and attendance records taken. Rosters: Creates a PDF of all course rosters, with an option to include ID photos. XLS: Creates a filter-sensitive spreadsheet of the courses report. 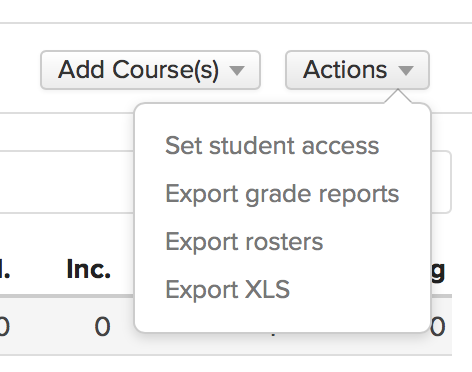 Grade reports: If all of the term's courses are finalized, you can export grade reports for all students in all courses. Publish courses: Lets you set all of the courses shown in the report to Published. You can only delete courses for which no students have any enrollment status. Whether a course has 176 enrolled students or boasts naught but a single student who withdrew after the add-drop date, you cannot delete it. Otherwise, to delete a course, click and confirm your choice. The Faculty report lists every faculty member and teaching assistant listed for the term's courses. Email/Text Faculty: Lets you contact everyone shown on the report (this is filter-sensitive). Export: You can export either ID Cards or a filter-sensitive spreadsheet of the faculty shown on the report. The Students report represents every student with an enrollment status in any of the term's courses. Jack Terwilliger is enrolled only in Undergraduate courses. He appears on the report only once. Jane D'Anna is enrolled in both Graduate and Undergraduate courses. She appears on the report twice—once for each program. Jamal Schraeder is enrolled in both Graduate and Undergraduate courses. He's also enrolled in a course that's not mapped to either program. Thus, he appears on the report three times. The Dashboard shows you student stats in graph form. You can also get at this information from a few different angles using the Enrollments report in Academics > Reporting. Email Students: Lets you email everyone shown on the report (this is filter-sensitive). Include unfinalized courses: This factors in-progress grades from your students’ unfinalized courses into the Term GPA, Cumulative Units, and Cumulative GPA columns. ID Cards: Export ID cards for all the students shown on the report. Schedules: Creates a PDF of the course schedules for the students shown on the report. Students XLS: Creates a spreadsheet of the report; you can add additional data columns before exporting. Transcripts: You can export official or unofficial transcripts. Read about your transcript export options in the Student Profiles article. The Attendance report collects all of the attendance records taken for the term's courses. If your faculty haven't been taking attendance records, then this report won't be of much use; if your faculty have been, then this table will summarize each student's attendance in real-time. The Schedule shows a master week-view calendar of all of the term's courses (provided they have meeting times). Click a schedule block to go to that course instance. The Waiting List shows all students who are on the waitlist for a course with limited enrollment. Click the course to go to the roster, where you can move the student off the waiting list and manage the course's enrollment. How do you change what the default academic year/term is that shows? UPDATE: There is now a "Default Term" setting in Academics > Settings. Where do you configure holidays (or other non-class days) for the purposes of calendar & attendance? I've looked in the school calendar, and also under the academic settings, and I'm not finding it. 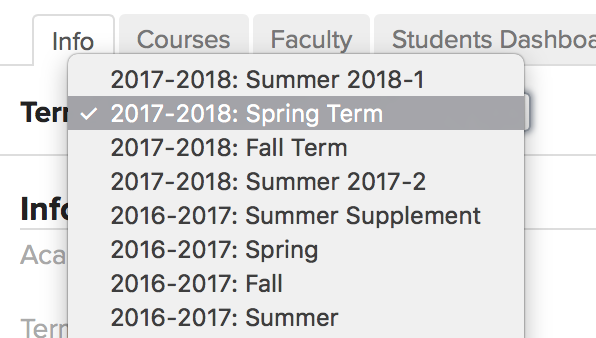 We'd like a way to manually bump up the Active Academic Term without waiting for it to change automatically on the date the next term starts. The last standard term is complete and everyone is dealing with the next term but they have to keep selecting that term because it is not yet the active one. You can change that in Academics > Settings > Default Term. Select the Term you want to show by default and that's what everyone will see by default when they look at any Term-based information tables. Last date of attendance is not available in the filter or Attendance tab. Is there another way to pull that data from Populi? That sounds like a bug. Would you please write us at support@populiweb.com about that?